ATHENS (Reuters) - A powerful earthquake shook western Greece early on Friday, damaging a port and a 15th century monastery, but causing no major injuries, officials and local media said. The magnitude 6.4 quake struck in the Ionian Sea, 50 km (31 miles) south of the island of Zakynthos, also known as Zante, Greece's Geodynamic Institute reported. The U.S. Geological Survey rated the magnitude at 6.8. Three people were taken to hospital on the island, two of them slightly injured, a spokesman for Greece's civil protection agency said. A series of aftershocks, the highest at 5.6, rattled the island and power was briefly disrupted. 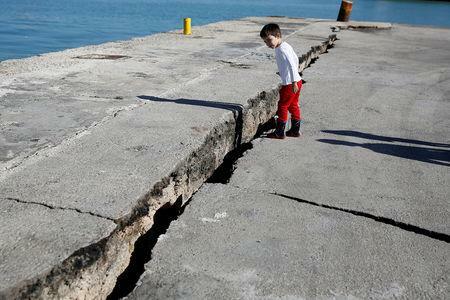 "We are not facing any particular problems," Zakynthos Mayor Pavlos Kolokotsas told Greek state broadcaster ERT. "Calm is being restored." 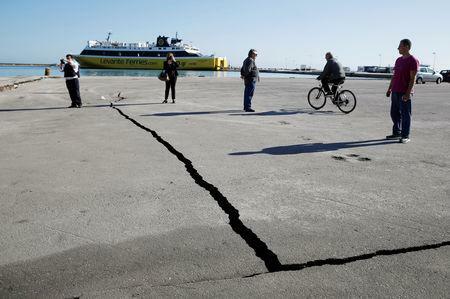 Extensive damage was avoided because quake-prone Zakynthos had adopted seismic protection codes in construction, said Efthymios Lekkas, head of Greece's Earthquake Planning and Protection Organisation. "The energy unleashed, based on the angle of the faultline, fanned out towards Italy," he added. 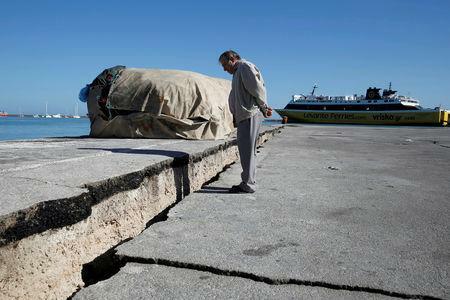 Italy's Il Messaggero online news site said the quake was felt hundreds of kilometres away in southern Italy. Firefighters in Calabria, Puglia and Sicily received thousands of telephone calls from worried locals. It struck at 1:54 a.m. (2254 GMT, Thursday). Greece straddles two tectonic plates and often suffers earthquakes. The EMSC European quake agency said sea levels had risen slightly, by about 20 cm (7.87 inches), but the increase could be higher locally. It later tweeted sea level changes were also observed in Italy.